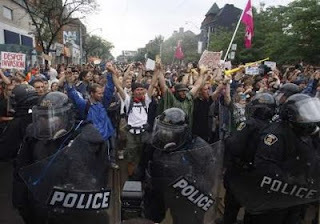 TORONTO - Politicians and protesters descended on downtown Toronto for the G20 Summit today, with leaders looking for a deal on how to repair the global economy — and a roving band of window-smashing militants looking for trouble. 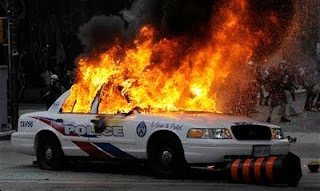 Just hours after the G8 Summit wrapped up in Ontario's cottage country, dozens of protesters in black balaclavas took to city streets kicking in windows, taunting police and even setting a cruiser on fire. A thick plume of dark grey smoke hung above the financial district, just outside the security zone where G20 leaders are to begin their meetings tonight with a glittering dinner. "Given the nature of the events and the challenges that confront us, I have never seen a G8 more fundamentally united in purpose, more frank in its discussions," Harper told reporters at the end of the G8 summit. "And I think that will carry forward into the G20." He said there was broad agreement among the G8 leaders on the need to prevent any "cascading events" that could lead to another financial meltdown. There was also a last-minute unanimous condemnation of the nuclear activities of both Iran and Korea. The 43-point summit communique admonishes both for their nuclear activities and holds North Korea responsible for the sinking of a South Korean warship last march. Iran and North Korea have become international pariahs for their nuclear ambitions, oppressive regimes and inflammatory rhetoric. "The world must see that what they spend on these weapons will not be the only costs they incur," Harper said. 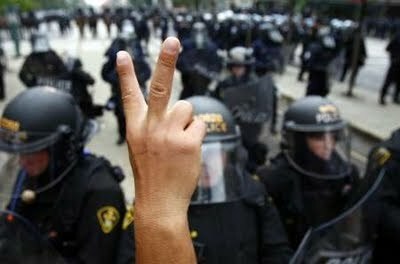 Such agreement at the G20 will be more challenging. The membership is diverse, bringing together advanced countries and emerging markets alike. And the main challenge they face — restoring the global economy to long-term health — requires short-term sacrifices that many countries are reluctant to take on. Efforts from some countries to put climate change and international development squarely on the G20 agenda were watered down to win wider support. 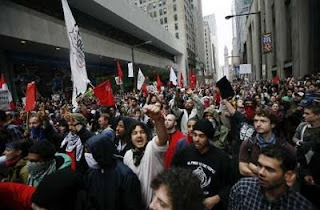 Several thousand protesters marched peacefully through the streets of Canada's biggest city to protest a range of issues, from poverty to financial reform. Later, another group of several hundred moved into the financial districts where a smaller number dressed in black turned violent. Riot police armed with a tear gas cannon kept them away from the security zone and officials said police would be clearing streets. EMS workers said at least three protesters suffered head injuries in a confrontation with police. 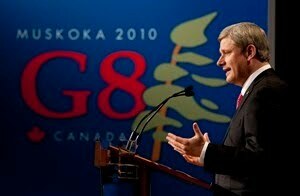 The G8 consists of Canada, the U.S., Britain, France, Germany, Italy, Japan and Russia. 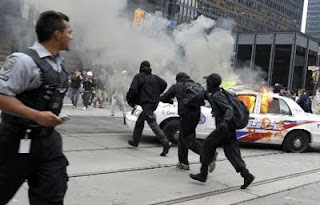 TORONTO - Officers in full riot gear are marching in waves through Toronto's streets as a yet another police vehicle has been set on fire. The officers, marching in formation and in groups of about 50, are pounding their shields in warning as they try to restore order in a city beseiged by violence. A newspaper photographer has been shot with a rubber bullet in the backside, while another had an officer point a gun in his face despite identifying himself as a member of the media. As leaders of the world's G20 nations arrive in Toronto the streets are in chaos despite a $1-billion security tab. A roving band of violent protesters have rampaged through the city, earlier torching three police vehicles and smashing windows, as terrified people ran for cover. 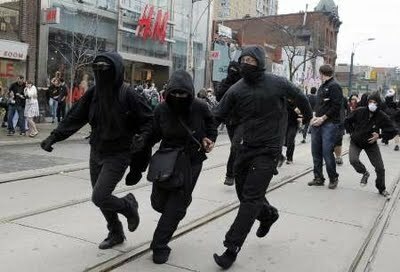 The protesters, dressed in black balaclavas and using what's referred to as a Black Bloc tactic, remain at large. At Queen Street and Spadina Avenue at least three protesters — one wearing what appeared to be a fake police shirt — started smashing a police car with a two-by-four and setting a second police car on fire. One person lit something on fire and threw it into the car, causing it to quickly go up in flames.